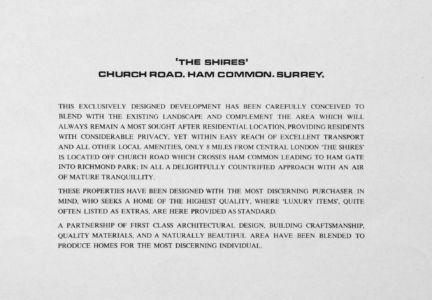 In 1966 a property development company, Chermside Andrew & Cobbett, obtained planning permission to build a cul-de-sac of 10 houses on the South side of Church Road; it is now known at The Shires. The site had been part of the grounds of the house named Cedarwood but previously known as Brown Gates and Whinhurst. At the beginning of the reign of King Edward VII the site where The Shires would be built was still part of extensive farmlands, extending from Ham Common to include what is now the Tudor Estate, all owned by the Dysart family and farmed by tenant farmers. 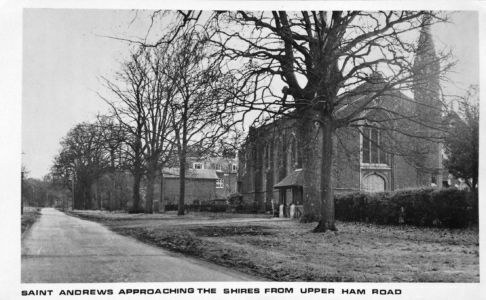 In 1910 a house was built on a parcel land to the south side of Church Road between St Andrew’s Church and Latchmere House, the first of several to be built along Church Road. The house sat on a generous plot of leasehold land with over 6 acres to its west and 7 acres to its east (which included the site where The Shires would be built over 50 years later). The house was named Whinhurst. In 1911 Sidney Fletcher Higgins and his wife Blanche lived in the house; they had lived in several houses in Ham previously and eventually would move to a home in Petersham. In December 1916 Mrs Blanche Higgins presented the prizes after a parish Whist Drive. By this time Mr John Fisher was living in the house Whinhurst; he worked with the house’s former resident Mr Higgins to raise money for a Ham War Memorial Fund. Mr Higgins was the manager of The London and Provincial Bank and was able to provide the means by which donations could be paid. The war memorial now stands in St Andrew’s Churchyard. Unsurprisingly the first years of the Great War caused major activity in the property market. 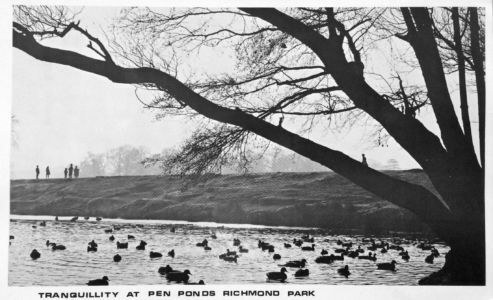 On 26th June 1915 The London Evening Standard printed an article in which Messrs. Chancellor of Richmond reported that there had been much activity and change in Ham and that there had been ‘an unprecedented demand for the larger residential properties in this charming rural spot’ which is ‘only nine miles from Hyde Park’. 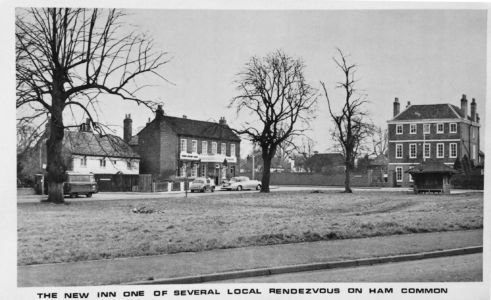 Through Messrs. Chancellors’ business several properties had changed hands during the previous year, and amongst those listed were four of the leasehold houses in Church Road, Ham: Latchmere (House); Park Gate House; Wilmer House and Whinhurst. The Surrey Archives hold a record of a 999 year lease on Whinhurst held by the widow Hilda Phillips of Ensleigh Lodge, Ham Common transferred on 25th March 1915. The lease for Whinhurst was re-assigned in 1927 and the name changed to Brown Gates. The new residents were Loftus Hubert Storey and his second wife Una. Loftus Storey turned the 7.372 acres to the East of Brown Gates (the current site of The Shires) into a polo field and founded the Ham Common Polo Club (the name was changed to Ham Polo Club in 1931); this was the very first Ham polo ground. Mr Storey became Club Chairman and his wife the Secretary. In his Packard motor car Loftus Storey and his neighbour William Wilcox from Wilmer House travelled around the country in search of good polo ponies. Mr Storey’s ponies were stabled in the grounds of Brown Gate Cottage (now The Coach House). 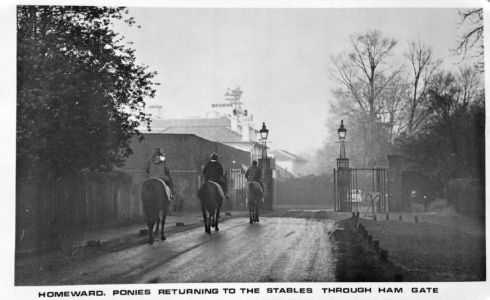 The outbreak of war in 1939 interrupted the use of Ham Polo Club; ponies were requisitioned for war service and land like the polo field was used for food production and in this instance for planting fruit trees. Between 1947 and 1949 Loftus Storey served as the club’s first Honorary Secretary. In 1951 Mr Storey published a book ‘The Training of Mount and Man for Polo’. After the war the Dysart family sold much of their Ham and Petersham Estate in a sale which continued over the two days, Tuesday 15th and Wednesday 16th November 1949 at The London Auction Mart at 155 Queen Victoria Street, EC4. The lease of Brown Gates Cottage was listed as Lot 119 with an income of just over £10 p.a. Lot 120 was the lease of Brown Gates, worth £20 p.a. Brown Gates was sold to Leyland Motors on 19th December 1949. During the war Leyland Motors had been producing tanks in its Kingston factory at Ham Cross but after 1949 the company reverted to the manufacture of trucks and buses. It appears that the company retained the services of a Mrs Williams as the resident housekeeper, and a gardener (possibly her husband). The generosity of the housekeeper was enjoyed by the Lascarides family at New House in Church Road who were given fruit grown in the Brown Gates’ orchard. During the 1960s Leyland Motors left its Kingston factory and sold Brown Gates. The house was bought by Mr Cyril David Cobbett a property developer. 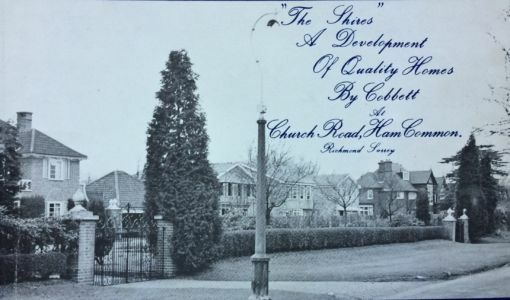 In March 1966 Mr Cobbett split the site, retaining the orchard land, re-selling the house with its remaining garden to the present owners. After submitting various applications for 3, 11 or 14 houses, finally in January 1967 Mr Cobbett’s company, Chermside, Andrew & Cobbett obtained planning permission to build the 7 detached houses and separate garages plus 3 terraced houses with integral garages one sees today. Some of the fruit trees from the Brown Gate’s orchard survived the development and continue to bear fruit. In 2004 The London Borough of Richmond upon Thames Council extended its CA7 Conservation Area to include not only Cedarwood and The Coach House but also the rear gardens of nos. 1, 2, 3 The Shires.